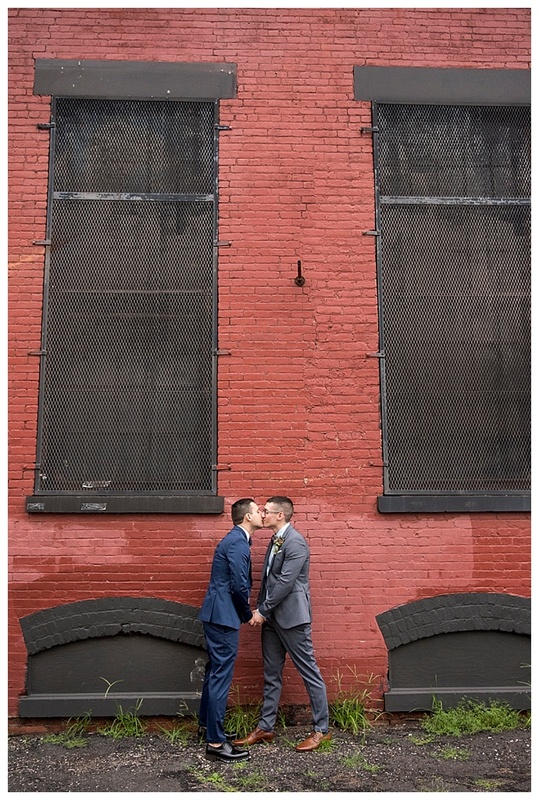 On the morning of their wedding day, Justin and Roberto awoke to rain. 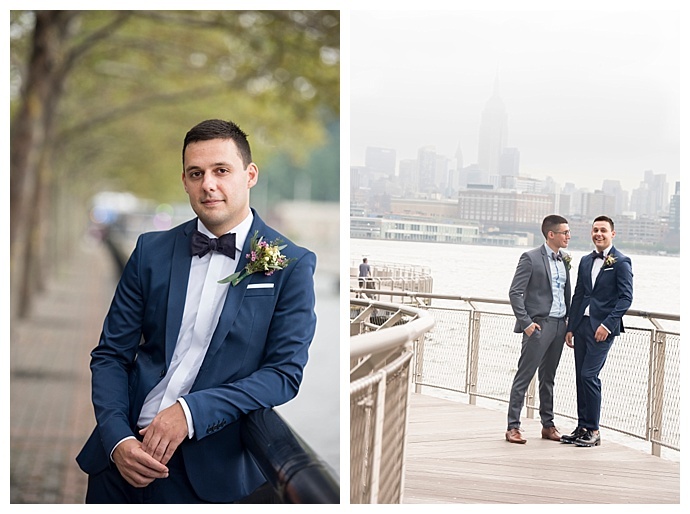 With the plan to take their wedding portraits along the Hoboken waterfront where Justin had proposed, they got ready for the day and crossed their fingers that the rain would subside. 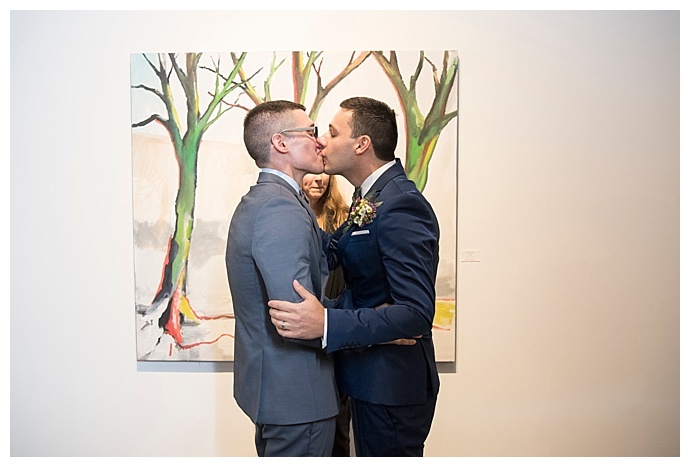 Moments before they began to take pictures, they got their wish. 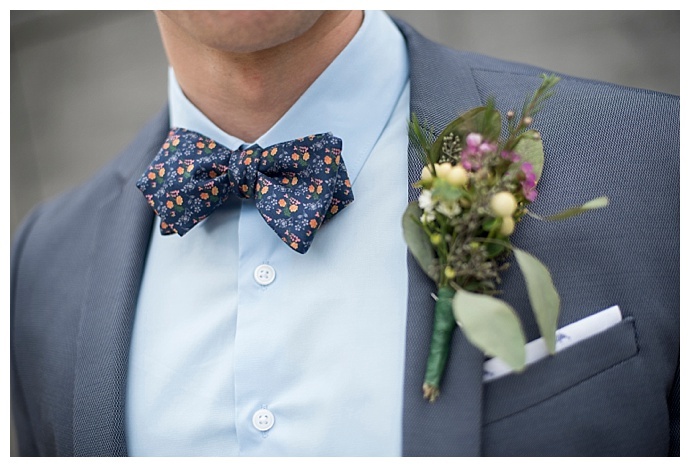 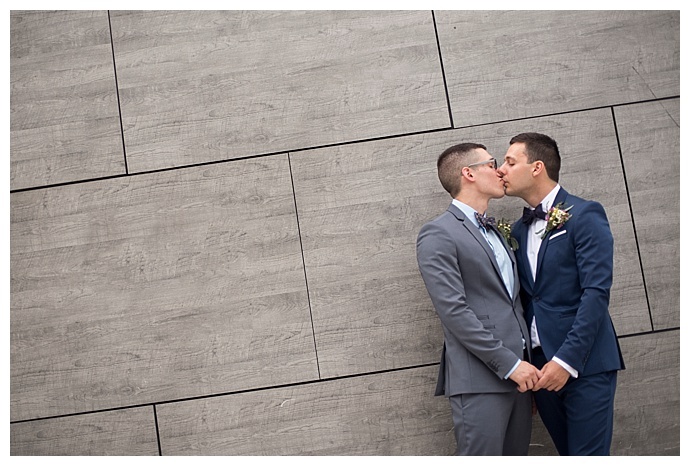 The rain stopped, allowing Studio A Images to capture some gorgeous photos of the grooms before the ceremony. 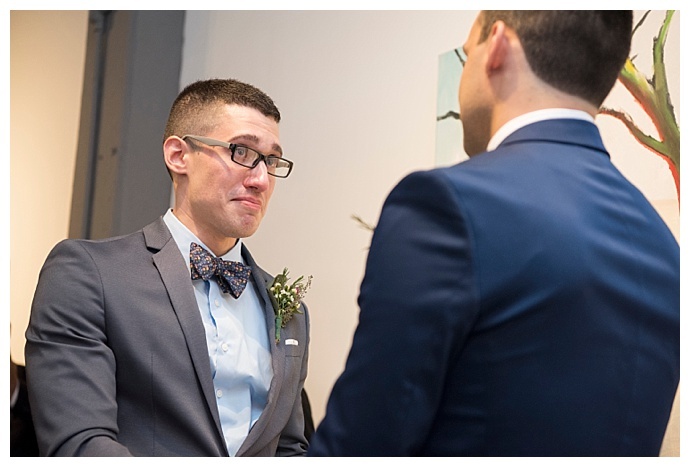 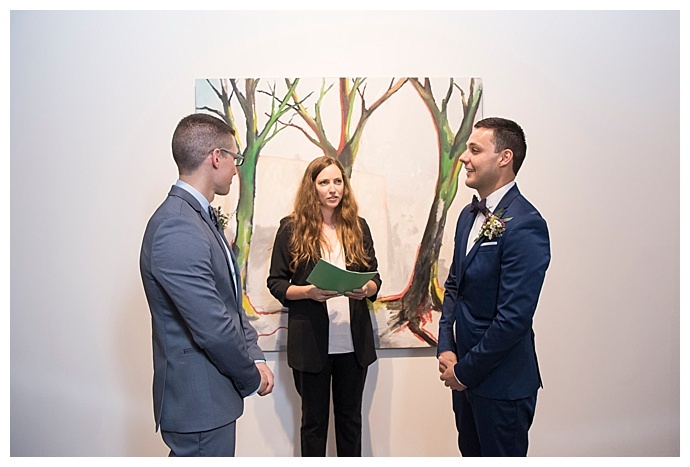 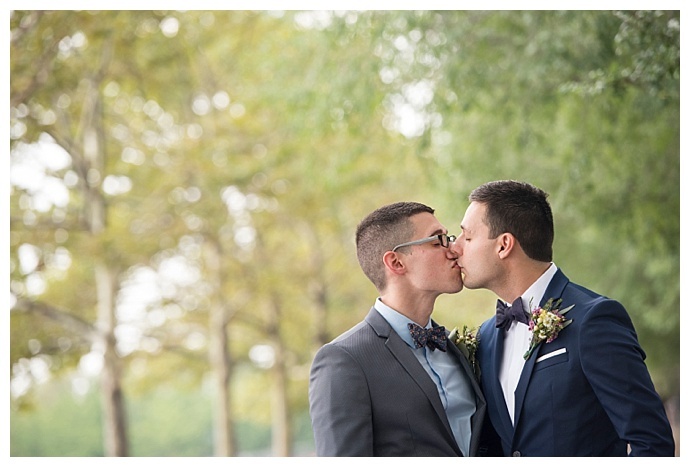 The weather continued to be on their side that day as it started pouring just after they ducked into Barsky Gallery for the ceremony, and it only briefly stopped at the exact moment guests were heading to the reception venue a block away. 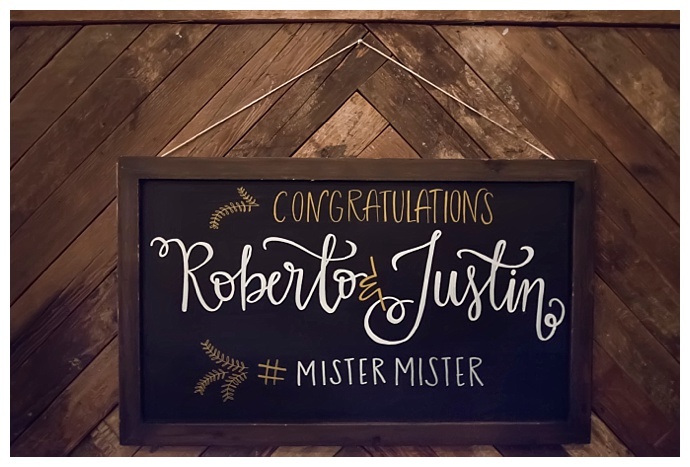 It seems everything about Justin and Roberto’s wedding day was meant to be! 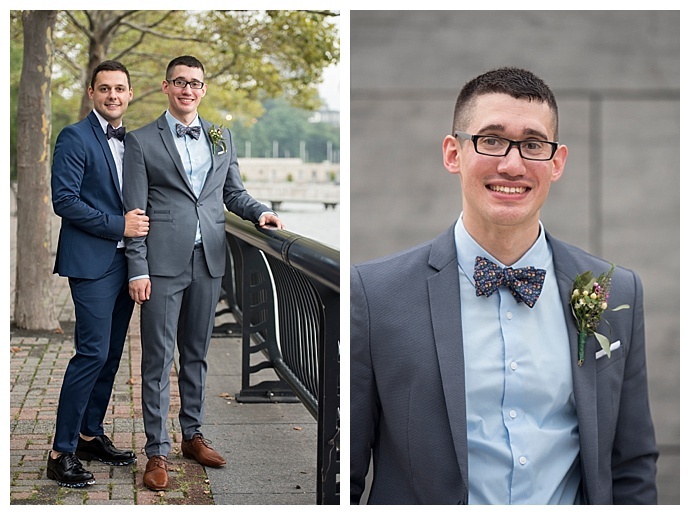 Just and Roberto both had an affinity for poetry, so when they enrolled at The New School in New York City to study poetry, it was inevitable that their paths would cross. 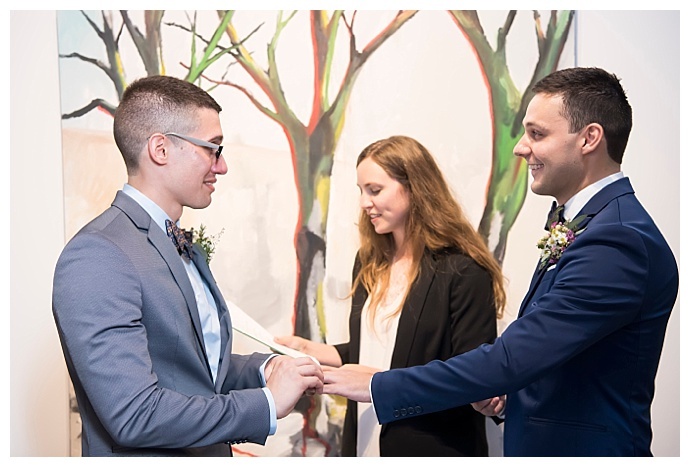 They first met eyes at a David Trinidad poetry reading and continued to run into each other at other readings throughout the city, and when they finally went on their first date, something clicked. 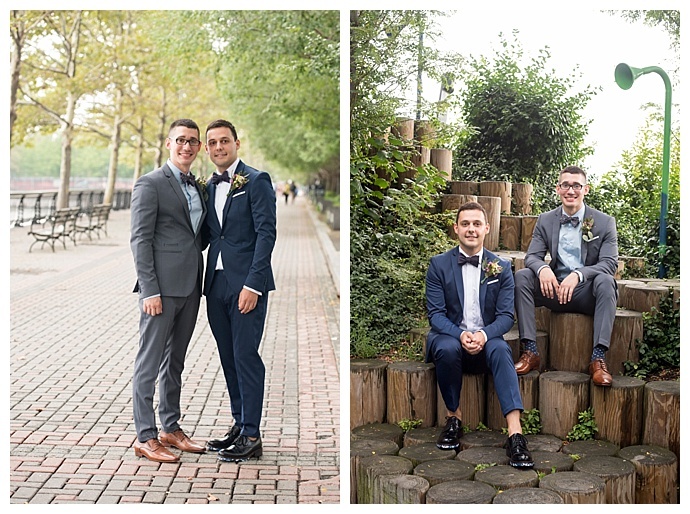 Four years laters, Justin brought Roberto to the Hoboken waterfront and surprised him by getting down on one knee while Justin’s sister and husband hid nearby to capture the special moment on camera. 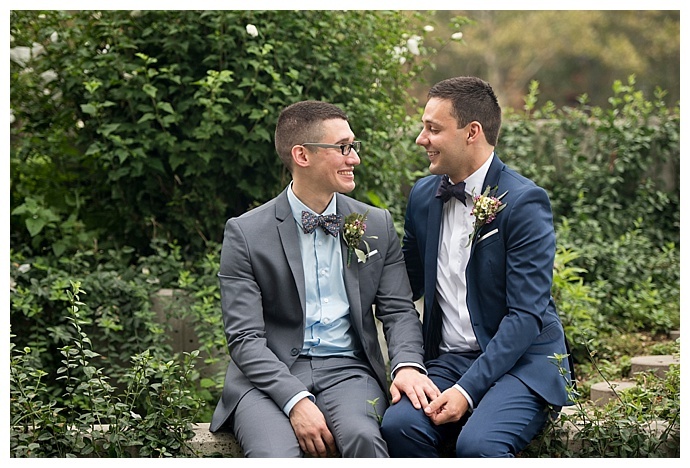 After the ceremony and a cocktail hour at the gallery, guests joined the newlyweds at Jack’s Cabin, a cozy restaurant a block away. 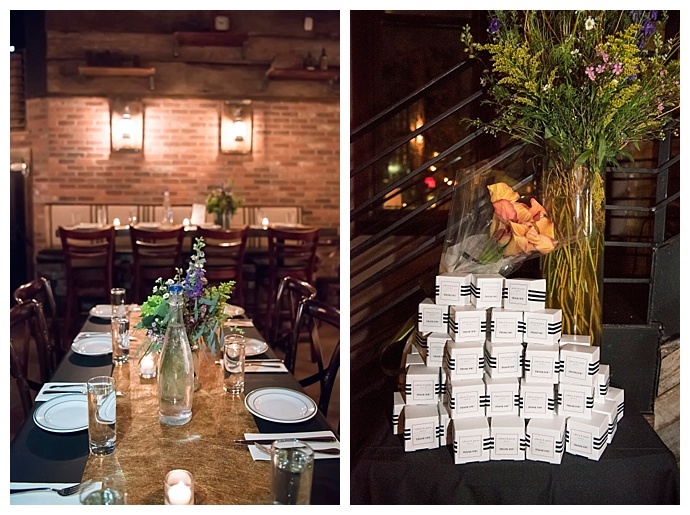 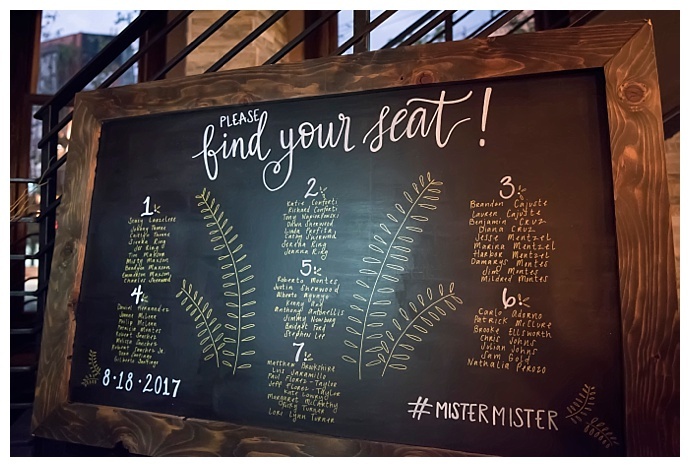 Wildlflowers decorated the tables and custom chalkboard signs helped guests find their seats. 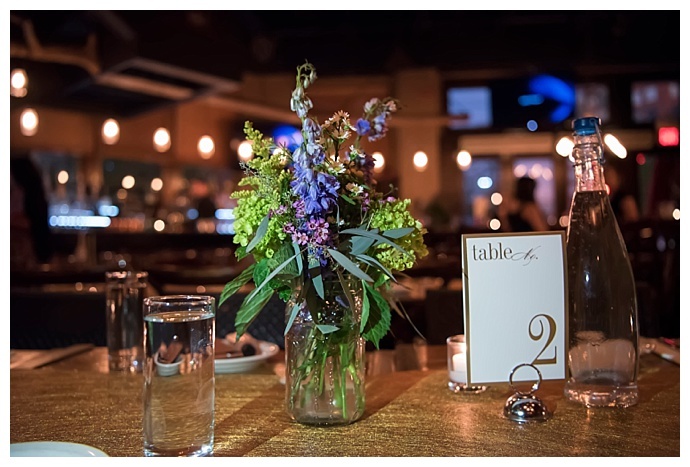 A delicious choice of entrees was served, including vegetarian options for the grooms, and sides of caesar salad, veal ricotta meatballs and mac and cheese were served family-style. 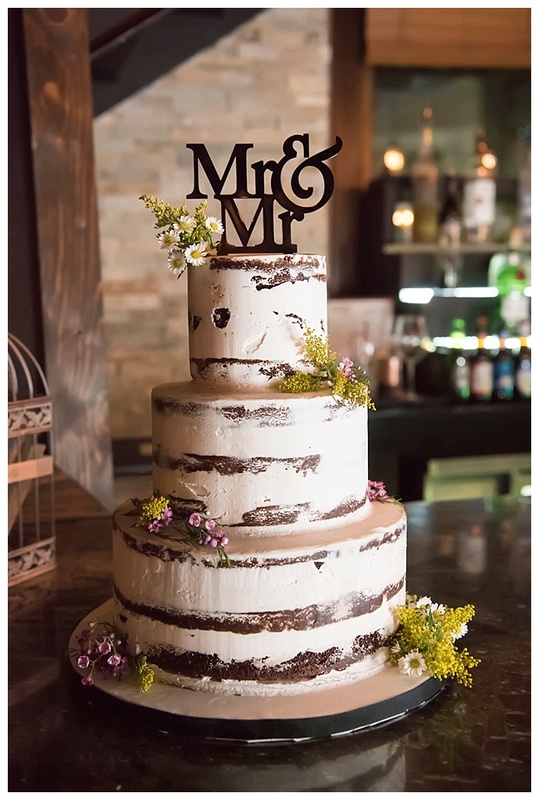 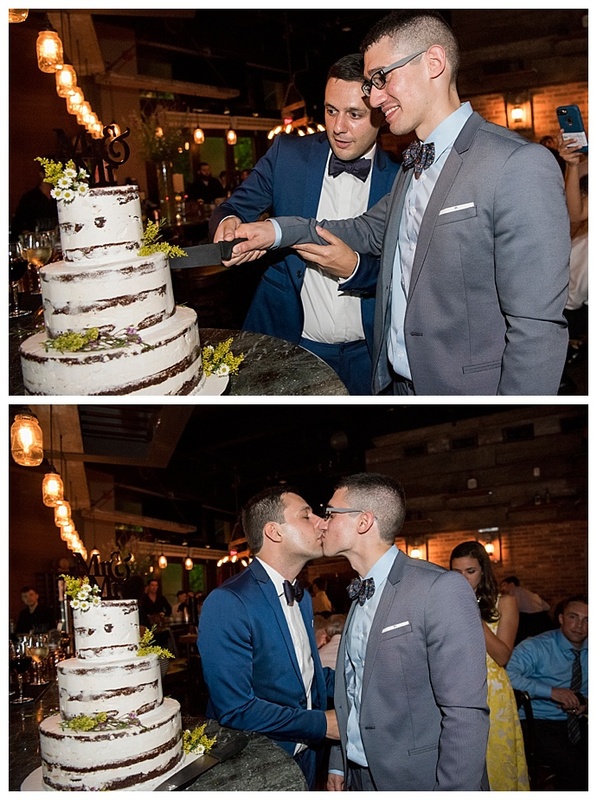 In addition to the naked chocolate wedding cake that was topped with a Mr. and Mr. cake topper, there was bread pudding and half-baked cookie dough for dessert. 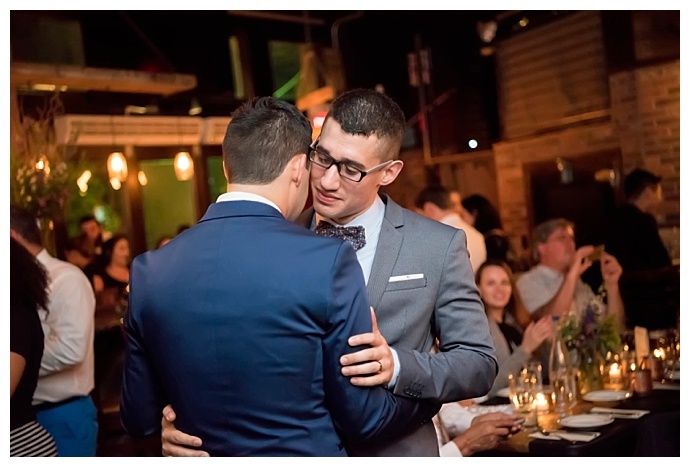 The newlyweds shared their first dance to Frank Ocean’s “Thinkin Bout You” and then spent the rest of the night on the dance floor with their friends and family as the DJ played a mix of Sylvester, RuPaul, Krystle Warren and Rufus Wainwright. 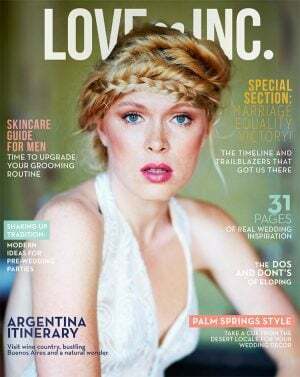 Wedding Ring: Tiffany & Co.